So much mystery and hard to see/ guess what’s going on here. I guess we see the bubble around the city and strange writing pertaining to it. Uhh the question here whether title of the page “bubbles” in the plural means that they exist at the same time, that is Anyalin has shrunk the Noridun bubble into a bubble for herself and TORIS (and where is Kohjen? ), or there are now two distinct bubbles. Also, our mysterious author of a mysterious story about a mysterious city is too good at show-dont-tell, and sometimes even at dont-show-dont-tell :-). 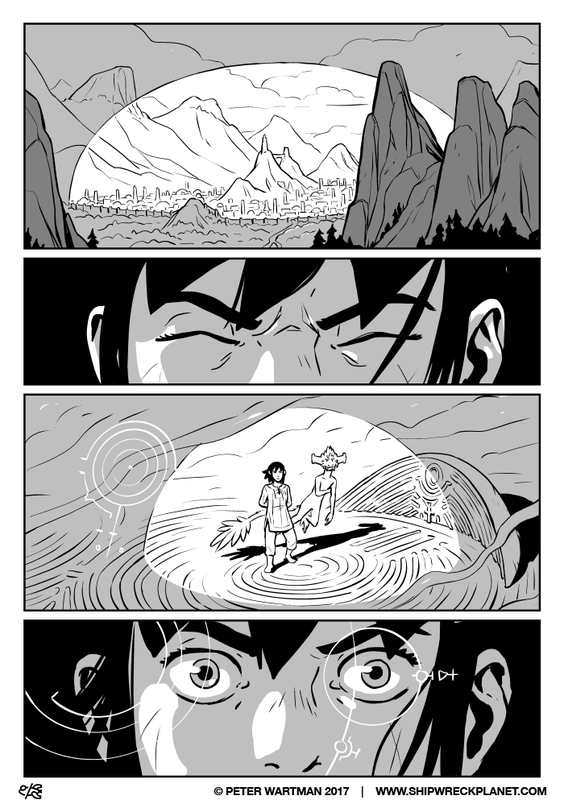 Honestly this sequence is really not benefiting from the twice-a-week-update thing — this page will (hopefully) make more sense in context. Although the other comment you posted is asking exactly the right questions :V.
The next question is what does this mean for the demons? If the bubble has shrunk, does that mean they are free to roam where they please? Or are they all stuck inside the bubble with Anya? Or if there are two, does the small bubble protect her and Toris?